Faith No More bassist Roddy Botum believes his band are "better" at working together these days. 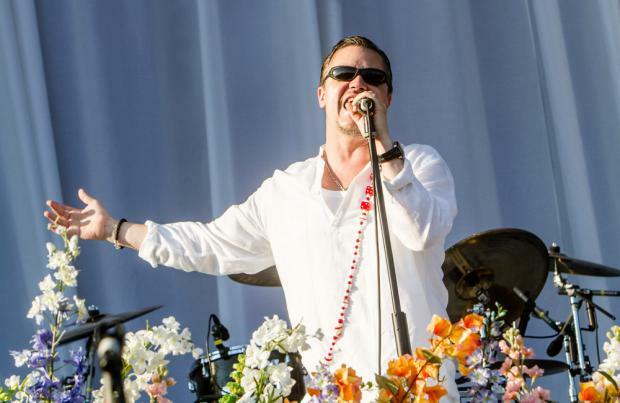 He also thinks the way they present themselves has become more "specific"
Faith No More rocker Roddy Bottum thinks the band are "better at working together" nowadays. The 'Easy' hitmakers marked a comeback with their first album in 18 years, 'Sol Invictus' last month, and believe their relationships are a lot smoother than when they were originally in the band. Speaking at Download Festival - sponsored by official partners Zippo - Roddy told downloadfestival.co.uk: "We make decisions on our shows in a different way these days and we are better at working together. We come to terms with the way we want to present ourselves in a much more succinct fashion, like the look of our stage and our live shows, what we wear and what we do." The 51-year-old keyboardist continued to say their presentation is a lot "stronger" and much more "specific" than the last time they played the heavy metal festival in 2009. He added: "The way we present ourselves is really specific. For me coming from a theatrical place, I like the way that it looks and the way it sounds and presentation of it. It seems a lot stronger than it was the last time we were around. Plus, we have new songs and are fortunate enough not to just be playing our old catalogue." The band - featuring Mike Patton, Billy Gould and Mike Bordin - performed on the main stage at the festival on Saturday (13.06.15) where they played several songs from the LP, including 'Black Friday', 'Motherf****r' and 'Superhero', wearing all white on a stage decked out with brightly coloured flowers.